The book that was so “hot” they ran out of printed copies. I being a major Colleen Hoover fan did not want to wait until they printed more so bought it on the ole iPad. Fallon meets Ben, an aspiring novelist, the day before her scheduled cross-country move. Their untimely attraction leads them to spend Fallon’s last day in L.A. together, and her eventful life becomes the creative inspiration Ben has always sought for his novel. Over time and amidst the various relationships and tribulations of their own separate lives, they continue to meet on the same date every year. Until one day Fallon becomes unsure if Ben has been telling her the truth or fabricating a perfect reality for the sake of the ultimate plot twist [x]. Review: I will always pick up a Colleen Hoover book without knowing what it is about. I know the story will never disappoint me. How does she come up with all these fantastic ideas so quickly? There were times when I was reading it and was like wow so happy great book but then I remembered the author of the novel and I knew a shitstorm was brewing and I was right. At the end (like all the books) a little plot twist is thrown out there and you’re like “Nooo whaaaat” but it gets worse and you just cry. (Side note: I don’t think I ever cried as much as when I read Slammed). I powered through this novel in less than a day. I love the happiness and I love the sadness and I love the quirky “ha-ha” bits that Colleen throws in there. I actually laughed out loud. Favourite scene: probably the dress scene. Oof!! Also how does she come up with these names? They are always so different. Fallon. Benton. Lovely. Ou, I liked how she mended characters from one of her other books in there too! Always highly recommend a Colleen Hoover book. Pick it up! 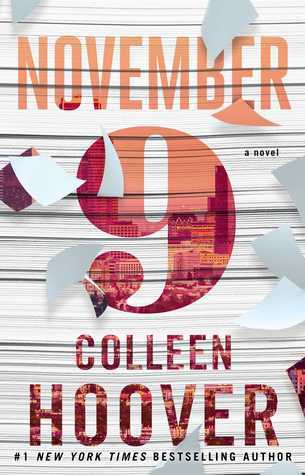 This entry was posted in book, book review, books, colleen hoover, november 9, review. Bookmark the permalink.